I had an old metal shed 6.5 by 6.5 by about 5' high. The sides were very rusted and holey but the frame was really sound. We put plywood over the sides and re-fit the bottom boards to be tight. We added two roosts, one about 18" high and one about 3' high. The chickens hop up onto the lower one and then always sleep on the higher one. 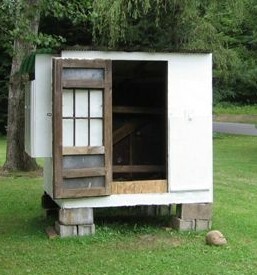 For the chicken door, we used 2 by 4's to frame out a 12" by 12" hole in the side. 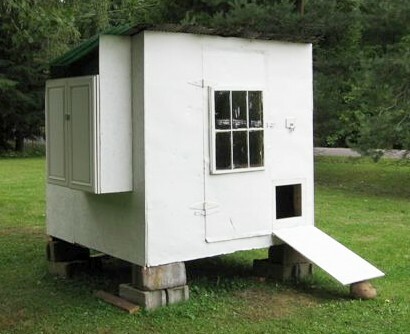 A piece of plywood completely covers the hole, locks at the top, and acts as a little ramp for the chickens. The door also locks. An old single-pane window in the door faces east. A small piece of plywood about 4" high is just inside the door in order to keep the shavings in. I use 1 bale of pine shavings to start, then add another bale, then when that gets nasty, I clean it all out. The feeder hangs from a nail on a ceiling board. The waterer sits on a small pedestal. The part I am most proud of is the nest box/isolation ward. This was a kitchen cupboard that I got at a local custom kitchen place for FREE. It is about 30" by 30". We divided it into 4 "cubbies", 2 of which are for nest boxes and 2 of which are for isolation/introduction wards. We attached the cupboard to the outside of the shed using big long screws. 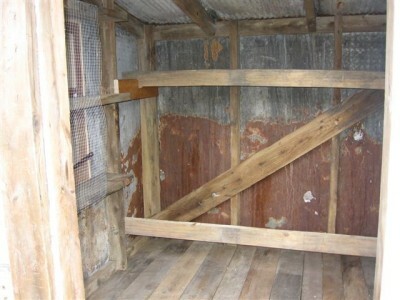 On the inside of the coop, we used a 2 by 6 as a "perch" so the chickens could jump up from the floor to the roost, then either go in the bottom compartment or jump on up to the higher compartment. All of the compartments have small pieces of fiberboard (about 2" high by 10" long) on the outside edge to keep eggs from rolling out when I open the doors. The doors close and latch against predators. I used welded wire (1/2" by 1/2" on the inside of the other two compartments for the isolation wards. The 2 by 6 shelf is where food and water can go. They are kind of small for full-grown hens but OK for night-time isolation. The hen in isolation can still see and hear the others who are on the roosts. This area is opened for ventilation when it is hot. I currently have 7 hens in this coop although I did have 7 hens and 1 rooster for a while. Based on square footage, I could have a couple more but this number worked well all winter (when they didn't come out for 2 months) without them killing each other! 2 nest boxes has been enough, though they sometimes yell at each other to HURRY UP! "Good use of an old shed"